In its heyday, the Pontiac Silverdome was home to the Detroit Lions and even hosted the 1982 Super Bowl. Despite its decline in recent years, the Silverdome was apparently built Detroit tough, even “defying explosives” as the New York Times put it. However, the botched implosion of the Silverdome on December 3, 2017 raised the attention of the national media and brought some brief limelight back to dilapidated Pontiac. The irony of the failed attempt to destroy the former home of the ever-struggling Detroit Lions was not lost on the New York Daily Times: “The Detroit Lions can’t seem to get anything right…” However, the second attempt at total destruction brought the house down and sealed the fate of the iconic sports temple. $56 million literally went up in dust on December 4th, causing many to briefly wonder whether that enormous investment was at best wasteful or perhaps, at worst, shameful. That money could certainly have gone for many other things that would have lasted a lot longer. 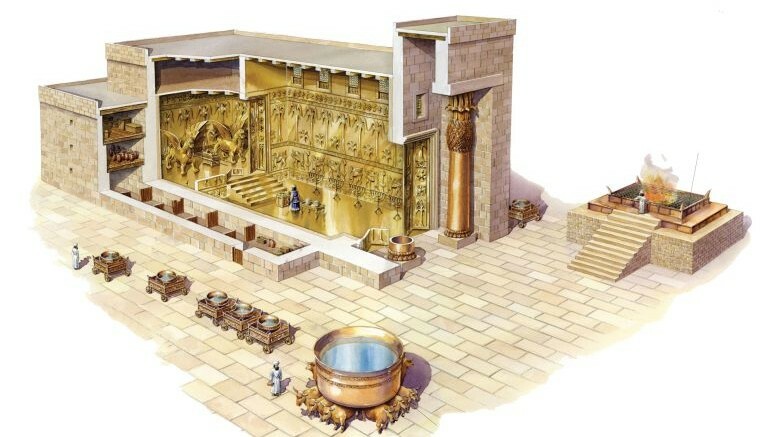 In his heyday, King David often sat and daydreamed about a different kind of temple. A place to worship God. A sacred home far better than the tent the Ark of God occupied. A palace for the Lord that would be “exceedingly magnificent”, and though David didn’t have the honor of building the temple himself, his son Solomon certainly did it justice. To describe the temple as lavish would almost be irreverent: Ornate wooden trim and doors, bronze fixtures and furniture, gold as far as the eye could see. In modern terms and analogy, there really is no comparison to the expense, architecture, or design. $56 million wouldn’t hold a candle to a worship center of such magnitude today. The temple was Solomon’s tribute to Yahweh and the fulfillment of a wonderful promise made to his father. What a sight it must have been! Yet where is this magnificent temple today? According to the Bible and other history books, King Nebuchadnezzar of Babylon ransacked, burned, and otherwise imploded the great temple a little over 400 years after it was built (longer than the United States has even been a nation). And to be sure, the end of the temple was a shot heard ’round the world. People must have been shocked, saddened, and sentimental all at once. But what’s worse, the religious and political nature of the temple site has resulted in few artifacts ever being uncovered. In fact, today there is so little physical evidence of the temple’s existence that some speculate whether it was actually built at all. But for believers, we know the beautiful and magnificent gift to Yahweh still sits somewhere below the dirt of the temple mount in Jerusalem, awaiting a final rebuilding. It’s kind of a sad story, isn’t it? An expensive and timely work for God demolished by His enemies. A temple that brought Him glory for so many years reduced to dust and ashes, not remotely preserved for our appreciation today. It nearly begs the question of whether David’s planning and gathering of resources was a waste. Or if Solomon made a mistake in attempting a great work for God, only to see it eventually come to an ugly end. After all, what is there to show for it now? “Nonsense” we would say, “no work for God is ever a waste!” And that would be true. Yet in our humanity, the end of a good thing, even a work done for God, can sometimes make us feel like something went to waste, can’t it? Discouragement is likely when we see years of labor and thousands of dollars of investment over time come to an untimely end, especially when it comes to ministry. Was it all for nothing? We know it was not, but we can sure feel like perhaps it was. A ministry that once thrived now struggles to exist. A Christian school building once full now sits vacant. Years of plenty turned to years of famine. If the work was indeed within God’s good plan, then why would it ever fail? Lest we despair at the ups and downs of ministry, we need always remember that even the most spectacular human gift to God served a purpose for a limited time only. The shelf-life of any ministry, whether brief or lengthy, is not necessarily tied to God’s level of pleasure or displeasure. Neither should an end to something good necessarily be attributed to the failures of the imperfect people involved in running it. God has always used fallen people to accomplish His greatest works, the longevity of which has always been entirely up to Him. The knowledge that no labor, organization, or ministry will last forever should never dampen our optimism for the present, and yet the reality of brevity ought to focus our thoughts on serving Him with all our heart, right now, today, with whatever opportunities He still allows. What then is “success”? Human nature tells us success means buildings, programs, and numbers. And this isn’t all bad. After all, a ministry with no people, buildings, or programs isn’t really accomplishing much. However, success in the Biblical sense is simply moving the needle forward in the personal righteousness of people. Whether God allows that to happen for ten people or 10,000 or whether the work lasts four months or 400 years is really irrelevant. After all, while God promised no work for Him is ever in vain, He also reminds us occasionally that His earthly work, done through the hard labor of humble people, is all for a limited time only. And there’s never any shame in that.